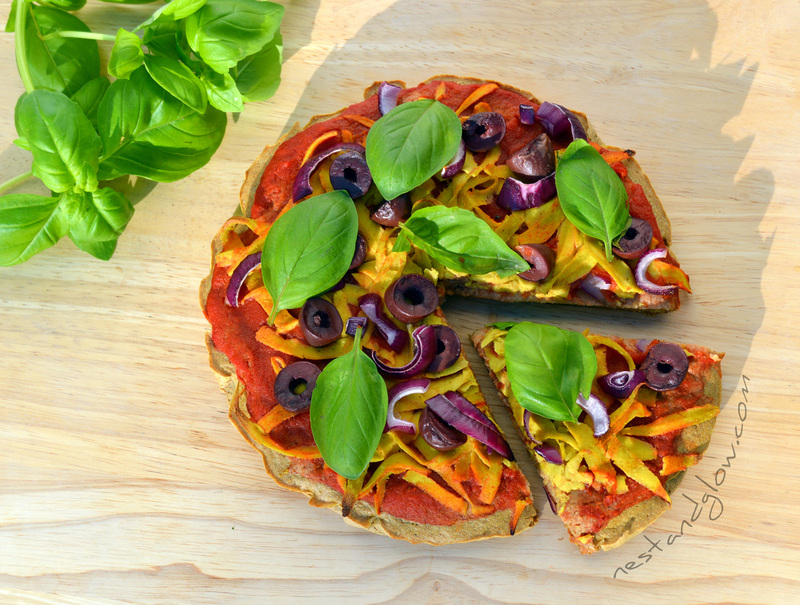 Looking for a healthy pizza that is naturally gluten free without any additives? 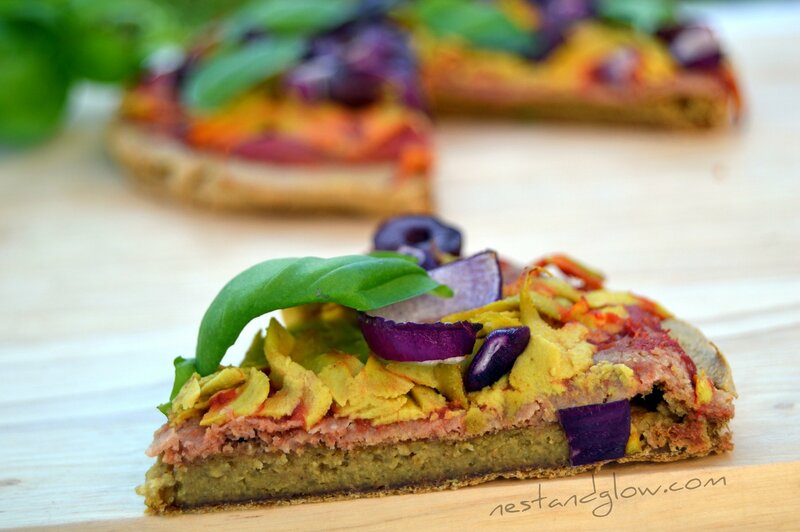 Try this easy gluten free Quinoa Crust pizza recipe today! As well as being gluten free, it’s low in fat but high in protein, fiber and nutrition. Most importantly it tastes delicious and will satisfy any cravings for bread or carbohydrates. Suitable for gluten free, vegan and dairy free diets. This is my favorite way to eat quinoa as the inside is soft and fluffy like well-cooked quinoa but the outside is lovely and crisp. The crusts are easy to make but you do have to soak the quinoa in advance so I usually bake a batch and freeze most before putting on any toppings and cook from frozen. If you are running short of time you can quick soak the quinoa by placing in a pan with water, bringing to a boil and then turning off the heat and waiting an hour. 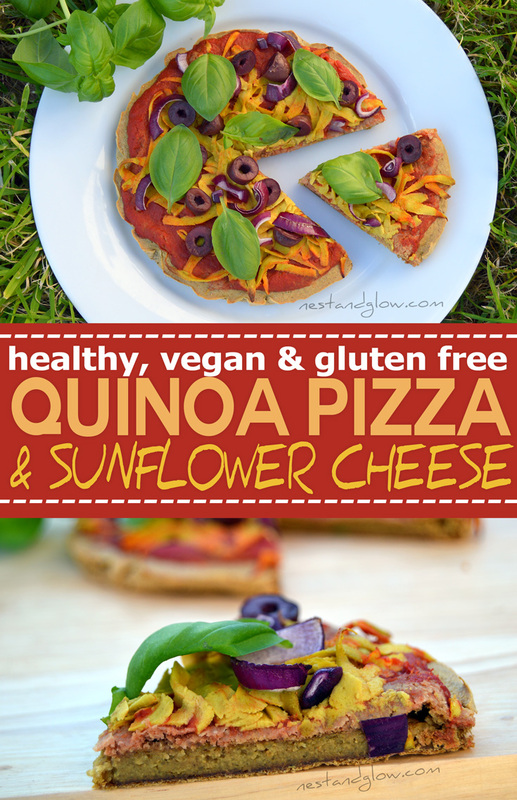 I generally use my sunflower seed cheese recipe to top this pizza. You can use other cheeses if you prefer but the sunflower seed cheese does work really well with this. It may not go gooey and runny like dairy cheese but it melts and gets a delicious toasted flavor. Use a high fat vegan cheese to get a runny melty cheese pizza. Soak the quinoa for 8 hours or overnight. Bake for 25 mins and 375 F / 190 C, let stand for 5 mins and then take out of the pan. Spread over the tomato mixture, top with grated cheese and the other toppings. Bake for 10 mins at 375 F / 190 C, then slice and enjoy! I’m trying to go completly flourless (no flours of any kind) so I’m wondering what would happen if I left the quinoa whole after soaking it instead of putting it in the blender to make this or the bread? You can sprout quinoa – it grows really quickly. But you have to rinse often as it also rots quickly! You can make nice sprouted quinoa tabouleh. Just wondering why you wouldn’t want to make this recipe – it uses no flours.